Just outside of Puerto Vallarta, we come across Nuevo Vallarta. Although Nuevo is only 15 minutes outside of Puerto Vallarta, it is across the state line of Nayarit. Nuevo Vallarta started out as a suburb for those looking to have a house where they could park their boats. Consisting of canals that go inland, it has many different real estate properties, ranging in size, style and price. Now a days it is the biggest timeshare location in all of Costa Banderas, with some of the most renowned timeshare empires like Paradise Village, which has its own golf course (El Tigre) and shopping mall, and the Mayan Palace. These timeshares have everything from regular hotel rooms to full ownership apartments and houses on the golf course or beach. Velas Vallarta also has a large development here; among many other smaller hotels, with fine dining restaurants, cafes and spa services open to the public. A major attraction of Nuevo Vallarta is Vallarta Adventures, one of the better known touring companies in town, offering anything from hiking tours, to swimming with dolphins, canopy and boat tours with dining and live music. There are several good eateries in this area including Fajita Republic, Brasil Steak House, and La Laguna offering some of the freshest and tastiest seafood around. The Flamingos Golf Club is also around this area. This private development keeps growing, adding timeshare buildings and recently a gated community development with affordable land and multi family apartment buildings. Several new developments have sprung up in this area, most of which are full or fractional ownership condominiums and are either beachfront or beachview. Prices start as low as $100,000 for a New York style loft in the buisness district of Nuevo Vallarta at 3.14 Living. The development will include a state of the art fitness gym and spa, as well as several locals for businesses and restaurants; with La Dolce Vita Italian restaurant already on board. Luxury Boutique condos start as low as $200,000 and range all the way to $2,000,000 for a beachfront penthouse with all the amenities you could ever require. Ocean Terrace boutique condos will have the largest terraces of any development in the Mexican Pacific. The focus of the project revolves around enjoyment of nature and the ocean. Prices start as low as $360,000 and range to $1,760,000. Between Nuevo Vallarta and Flamingos there are still many large beachfront parcels available for hotel or large condominium development opportunities. Mexico Land Catalog. Villa White Swan is a yacht owner's dream with 400 feet of canal frontage. Hacienda style Island Villa tucked inside the "Nuevo Vallarta" intercoastal in Puerto Vallarta. Built on three lots totaling 27,469 ft2 (0.6 acres) and over 400 feet of main canal frontage!! Great use of cantera throughout. Living quarters surround a fountain in the center of an open air atrium. 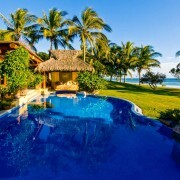 This incredible Estate sits on 3,600 m2 of sandy beachfront land with 60 meters of frontage! Villa Salamandra is a baroque-maritime Arabian style beachfront Residence.Richness in the design of shapes, parapets, connecting bridges and stairways, in the geometric style of Vasarely and emotive inspiration of the light, of the "white on white".
" 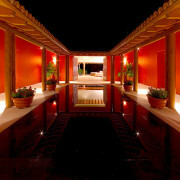 We just returned from a weeklong stay at la Estancia, and can't wait to go back. I don't know which was more impressive - the wonderful staff or the beautiful suites! " Located in the Mayan Island on the spectacular beach in Nuevo Vallarta, this condo is beautifully decorated in an asian theme with all top of the line luxury finishings. 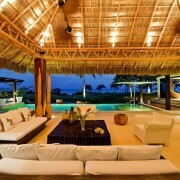 Modern and luxurious penthouse on the long and child friendly beach of Nuevo Vallarta. 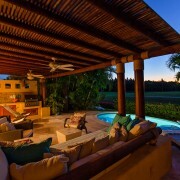 Casa Gilbert is a luxury villa on the canals of Nuevo Vallarta. This home is perfect for boaters.